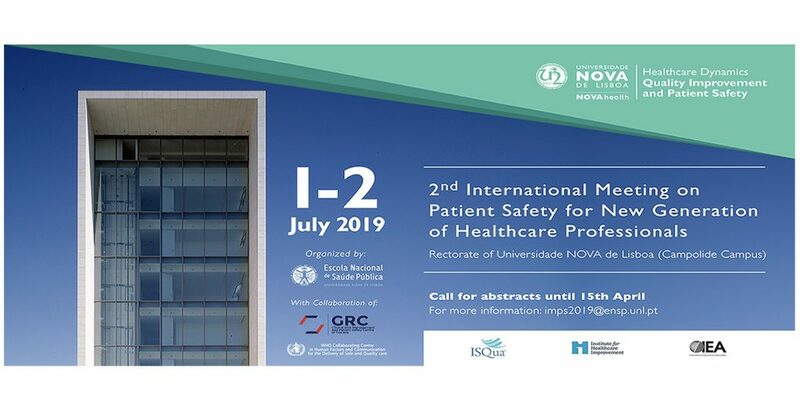 Encontra-se a decorrer, entre os dias 11 de janeiro de 15 de abril de 2019, a fase de submisão de abstracts para o 2nd International Meeting on Patient Safety for New Generation of Healthcare Professionals, que se realiza nos dias 1 e 2 de julho de 2019 na Reitoria da Universidade NOVA de Lisboa. O 2nd International Meeting on Patient Safety for New Generation of Healthcare Professionals é organizado pela Escola Nacional de Saúde Pública (ENSP-NOVA) e o grupo de investigação NOVAsaúde – Quality Improvement and Patient Safety (integrada na área estratégica Health Dynamics), em parceria com o Centro de Gestão do Risco e Segurança do Doente da Região Toscana, Itália (Centro Colaborativo da Organização Mundial da Saúde). Os abstracts devem ser submetidos para imps2019@ensp.unl.pt até ao dia 15 de abril. Consulte as regras para submissão de abstracts. It is open between January 11th to April 15th, 2019, the call for abstracts for the 2nd International Meeting on Patient Safety for New Generation of Healthcare Professionals that will be held on July 1st and 2nd at the Rectorate of the NOVA University in Lisbon (Campolide Campus). The 2nd International Meeting on Patient Safety for New Generation of Healthcare Professionals is organized by the National School of Public Health (ENSP-NOVA) and the research group NOVAsaude – Quality Improvement and Patient Safety (integrated in the strategic area of Health Dynamics), in partnership with the Center for Risk Management and Patient Safety in the Region of Tuscany, Italy (World Health Organization Collaborative Center). The abstracts must be submitted to imps2019@ensp.unl.pt until April 15th. See the rules for submitting abstracts.